Say what? There’s a difference? Yes. If you’re unfamiliar with the difference, perhaps having grown up in the big city and always figuring the two things are synonymous, at its most basic it’s this: hay is animal food, straw is animal bedding. That might seem kind of simplistic, but it’s important in understanding why we want to use straw instead of hay. Straw bales are made up of dried, hollow stalks of a cereal grain like wheat, a secondary crop left over when a farmer harvests his field. Straw bales are mostly seedless, any remaining seeds in them merely accidental. Having little use beyond animal bedding, they are generally really cheap. For best results, make sure you’ve found straw bales, not hay bales. Hay will, I am told, also work quite well, but be prepared to have to deal with a lot more unwanted weeds. Hay, on the other hand, is made of grasses, tends to be greener, and as a food source for animals is chock-full of seeds and grains just waiting to sprout up and fill your garden. They also tend to be more expensive, and heavier. So be sure to ask for STRAW bales, not HAY bales unless you want to grow a Chia Pet. Set up your bales in whatever configuration you would like, depending on the space available and what you want to grow. Look for a place with plenty of sun, but otherwise you can literally do this in your driveway should you so desire. I’d recommend laying down weed block underneath if setting them up over ground, and if your area has critters like mice or rabbits that might want to lay down some gopher mesh of some kind. It seems like straw bale gardeners are a little bit divided on which way to lay the bales, but the majority lay them cut side up (i.e. with the strings on the sides) and I think it makes the most sense. You sacrifice a little bit of area, but I think the bales hold together and hold moisture better when they are cut side up. Straw Bale Gardens, by Joel Karsten, is a great resource. Before you go planting anything into the bales, there is a minimum 12 day process you need to do with them to get them ready. If you have a lot of time, you can simply keep them wet for 3-4 weeks and let nature take its course. In some climates bales can last multiple seasons, and in that case they will be ready to go right away. But if you’re like me and are both anxious to get started and like want to be proactive, here’s the method I’d recommend, that comes from Joel Karsten’s book Straw Bale Gardens (which I found worth every penny). There are also some other methods out there, like this one, but they all follow a similar procedure. Day 1: Sprinkle the top of each bale with 1/2 cup of a high nitrogen fertilizer, and soak ’em good and proper. When you look on bags of fertilizer, you will see three numbers, which signify percentages of nitrogen (N), phosphate (P2O5), and potash (K2O). You may also use blood meal, or any similar organic substitute. You will need about 1 pound of fertilizer per bale. 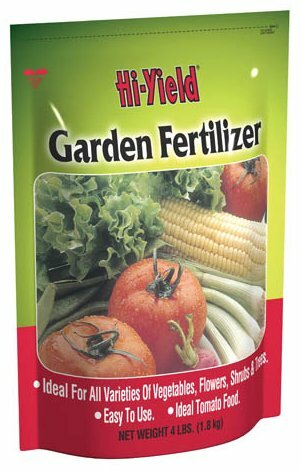 Fertilizer comes in many different varieties. Look for a very high nitrogen type, with no weed killer. After sprinkling on the fertilizer, just use your hose to really soak it into the bales as well as you can. Day 2: Just soak ’em. Skip the fertilizer, and just make sure the bales are watered well again. If you’re like me, this is a great time to get the kids involved. Since the goal here is simply “soak the bales” there’s not much they can mess up as long as you’re ensuring the bales actually get as soaked as they will almost certainly soak themselves. Helping me soak the bales was one of my oldest son’s favorite jobs. Rain gear optional. Day 3: Again, 1/2 cup of fertilizer per bale, washed well in. Day 4: No fertilizer, just a good soaking. You should start to notice by now that it takes less water to get the bales fully saturated. Day 5: 1/2 cup fertilizer, washed in well. At this point you may start to notice the smell of decomposition within the bales. This is good! If you stick your hand inside you may be able to detect the extra warmth being generated inside, and the tops of the bales will begin to darken. Days 7-9: Cut back to 1/4 cup of fertilizer each day, watered in well. The bales will be very active in their decomposing over these days. Stick a soil or meat thermometer inside the bale a few inches and you will be able to see just how hot it can get (sometimes as high as 100 degrees, depending on the air temperatures). While this isn’t specifically necessary, I also started wrapping my bales with plastic sheeting (tucked into the lower bale twine) over these days, and the “greenhouse” effect seemed to accelerate the process that much more. Wrapping the bales in plastic sheeting is a great way to keep them warm and accelerate the decomposition happening inside — especially if the weather in your area is still cool. Day 10: Sprinkle each bale with 1 cup of a balanced fertilizer, and wash in. By “more balanced” I mean somewhere in the range of a 10-10-10- fertilizer. That is, one that contains some P (Phosphorus) and K (Potassium) that can be washed down into the bales and balance the root zone somewhat. Yep, just leave ’em alone for the day and let the microbial dance inside them continue. Day 12: You are ready to plant, son! Get thee to your favorite local nursery for some seeds and seedlings, because your bales are done, and ready to be turned into a garden. The bales have darkened and are ready for planting! To be continued in Straw Bale Gardening: Part 3 – Planting. I’m so glad that I didn’t follow up on my first assumption a day or two ago, to comment about back the danger of filling with compost behind your straw bales and causing your wood fence to rot away! This article is great information and makes me want to order some straw bales delivered soon! I have the perfect spot for them! Only problem is, it will just raise the garden up to dining table level for my backyard deer population! Great article, and I’m looking forward to the next issue. the straw/hay thing has always driven me nuts. We live in FARMING communities and it is incredible how many people have no clue there is a difference! Chris did a great job of explaining the difference, even though I already knew, it will surely be a great help to those how don’t know that horses and cows can’t survive on straw! Yes, we’ve been careful to keep them back from the wood fence. I also wanted the ability to walk back there anyhow to make harvesting that much easier from the other side. Too bad about the deer. What about some sort of cheap (but I would have to assume TALL) fencing around the garden area? Thank you for this article. I live in Ks. it is May 26 and I found some straw bales today from last year. I have plants that I want to get in like sweet potatoes and tomatoes , cucumbers and squash. Do I have to do the wetting process or can I fill the holes with soil and get started. I’d say it all depends on the condition of the interior of the bales, which probably depends on if they’ve been kept dry or not. If they’ve been out, exposed to the elements for a year, the insides are likely already broken down somewhat I imagine you’re good to go (some straw bale gardeners forego the fertilizer altogether and simply keep their bales wet for 3-4 weeks to prep them). I would still recommend sprinkling them with a balanced fertilizer and given them a really thorough soaking though, before planting. This is my second year, at straw bale gardening. I have back problems and this has let me garden, without all the pains. I absolutely love it. This year, I formed a wall with bales and put top soil in center…Makes for more planting in the center, and still reachable. This is truly, actually, definitely, surprisingly, remarkably, completely, amazingly, absolutely, enormously, really, quite hugely, very much helpful! Thank you! this is such an interesting way to garden and since I have some limitations on movement, I really am excited to try this. The Kennedy School McMenamins in Portland has a few samples of straw-bale gardens for people to see if you’re in the Oregon area.